Head of Border Police, Fredolin Lecari, conducted a working visit to Washington, DC, between September 10 and 13. The agenda of the visit included a series of talks with US counterparts on the law enforcement branch, on the priorities of bilateral cooperation on the security dimension and on combating cross-border crime. In this context, the head of the Border Police had high-level meetings with US Federal Office of Investigation (FBI) Director Christopher A. Wray, US Justice Department leadership, Rod J. Rosenstein, Director of the INTERPOL Main National Bureau, Wayne Salzgaber, Assistant Deputy US Secretary of State for International Affairs on Law Enforcement and Drug Abuse Control, Brooke Darby, and others. In the talks with US officials, the very good cooperation in the field of security was appreciated, but also at all levels of cooperation between the law enforcement agencies of the Republic of Moldova and the USA. At the same time, the concrete prospects for strengthening the Moldovan-American partnerships, including the threats to international security, have been addressed. The interlocutors welcomed the mutually beneficial successes and benefits of multiple projects developed in partnership with US law enforcement agencies and agencies, especially the consistent support provided to the Moldovan Police and not only in the field of vocational training. An important point on the agenda of this visit was the participation of the Border Police Chief, together with the US Ambassador to the US, E.S. Cristina Balan, at the FBI National Academy Academy (FBI NA) Leadership Ceremony, by Cristina Schimbov, President of the Women's Police Association. She is the first lady of the National Police team to have been admitted to FBI NA courses, along with 200 other police officers in 25 countries. The event took place yesterday, September 13, at Quantico, Virginia, USA. 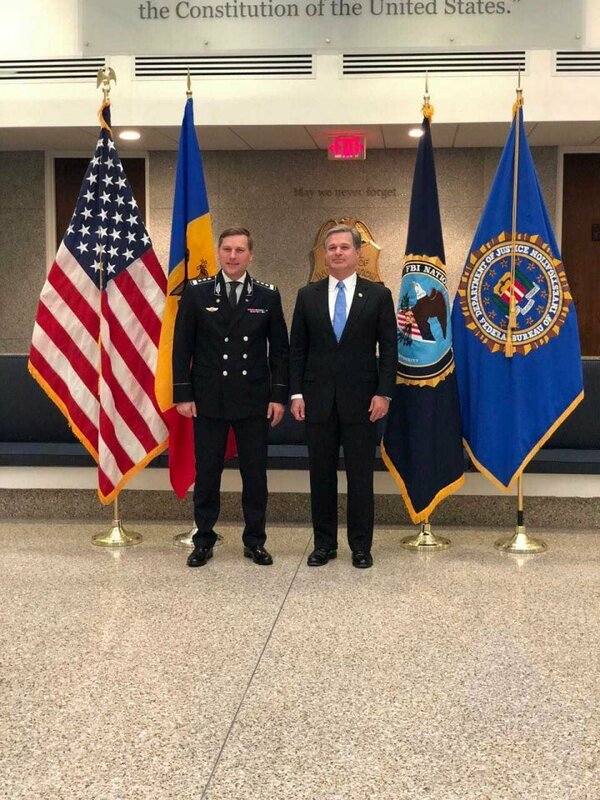 It is worth mentioning that Mr. Fredolin Lecari is one of the first graduates of the US FBI National Academy, finishing the course in 2015. In the margins of his working visit, the Head of the Border Police participated as a guest at the September 11th Ceremony to commemorate the victims of the terrorist attack, which took place at the US Department of Justice and served by Jeff Sessions, the US General Prosecutor.